Sound (5.9/10) – Priced below the $50 mark, the UE350 is a consumer-oriented dynamic-driver model with a bass-heavy sound signature. By UE’s own admission, the 350 was tuned to provide a club feel, which shows through in the depth and power of the bass. Though not a bass monster in the same way a Sony XB40EX or MEElec M31 may be, the UE350 is unlikely to leave anyone wanting for rumble or power. The Dunu Trident, which has a similar frequency balance, is slightly more controlled at the low end and tends to sound tighter and punchier but the overall bass quantity is comparable between the two. That said, the note presentation of the UE350 is even softer than that of the Trident, causing the bass to sound a touch flabby and muddy, though not offensively so as was the case with many older dynamics of this sort. The midrange is warm and full, with occasional bass bleed and average detail resolution. Clarity can be slightly disappointing and vocals occasionally sound a touch muffled next to the similarly-priced Dunu Trident and Klipsch Image S3. Smoothness is very impressive, however, making the UE350 much easier to listen to in the long run than the S3 and much more forgiving. The top end is slightly laid-back to avoid listening fatigue and performs similarly to the midrange in clarity and detail resolution. Top-end extension is good but the overall tone is still a touch dark – those looking for more neutral sound with crisp, sparkly treble should invest in the pricier UE500. The presentation of the UE350 is surprisingly competent – soundstage width is above average and the earphones – while not as well-layered or resolving as the Dunu Trident or pricier UE500 – give a good sense of space for an entry-level product. Klipsch’s similarly-priced Image S3 sounds significantly smaller and more constrained despite boasting better detail and clarity. The note thickness is a little too great for the UE350 to sound as clean and airy as the UE500 does but on the whole the presentation is quite competent. 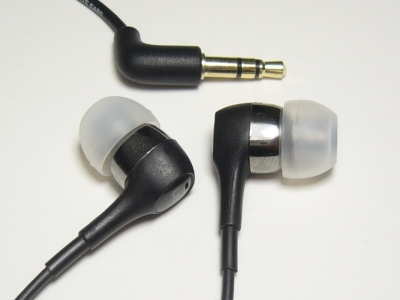 Value (7.5/10) – Back in the pre-Logitech days, UE released a couple of entry-level dynamic-driver earphones under the MetroFi badge which – while not bad to listen to – were simply priced too ambitiously to be very good value. With the UE350, Ultimate Ears has retained the consumer-friendly sound signature of the old MetroFi earphones while improving the overall usability and lowering the asking price. There are still minor issues such as the new clamshell carrying case – which is small and frustrating to use compared to the old one – but on the whole the UE350 is a solid entry-level product with a clear target audience; audiophiles are clearly expected to save up for the UE500.